It begins with one simple item. Maybe it’s a cup left on the coffee table or a shirt tossed into the corner of your room before bed. I’ll pick it up later, you think to yourself, but little do you know that you’ve just initiated the devastating snowball effect of messiness. The next day you come home from a hard day at work, and all you want to do is sit on the couch and lounge. Before you know it the cup is now accompanied by a plate and a crumpled up paper towel, the dirty shirt is now a full dirty outfit. Tomorrow is the day, you foolishly attempt to affirm yourself, blinded to the beginnings of a disaster. Time goes by and before you know it, you’ve reached the point of no return. Your dog has been lost for days in the heaps of garbage and you don’t even know where the front door is anymore. You’ve resorted to the life of a hermit, praying that someday soon a rescue team will find their way to you and free you from this prison of clutter. Okay… this might be a bit of an exaggeration, but it does hold a simple truth, keeping your home clean and clutter-free takes some effort and you don’t want to push it off for too long before addressing the issue. At UMG, we’ve got you covered with our professional, non-toxic, eco-friendly, residential cleaning services, but for the days that you don’t have us scheduled it’s important to keep your home tidy. We understand that finding the motivation to clean can be difficult, so we’re offering a couple pieces of advice to influence you to spruce up your place. To prevent the snowball from beginning its roll, it’s crucial to start small and not let things clutter up. Bring that dirty glass to the dishwasher, throw the dirty clothes in the hamper, sweep up the kitchen. These simple and quick tasks will prevent a build-up of mess that will be harder to find the motivation to clean later on. So start with the simple things, it will go a long way in maintaining the cleanliness of your home. If you have a friend that would have no problem coming over to give you a hand cleaning up your place, first things first, cherish that friend because they are one in a million, then invite them over for help. For the average friend that will take a little persuading, offer them a meal or some refreshments as a reward for their help. Having an extra pair of hands can be extremely beneficial when cleaning up clutter, as well as it will make the time seem more casual instead of just being a necessary chore. In case you’ve been holding on to something unnecessary for far too long, they might also be honest enough to prevent you from spiraling into life as a hoarder. It’s important to make cleaning a routine activity in your schedule. Let’s say you have UMG Cleaning services coming every other Friday, dedicate some time on the Friday that we are not providing you house cleaning, and do a few things around the place. This, once again, will prevent clutter and messes from building up and becoming a daunting task that will seem beyond saving. Much like working out or getting some tasks for the office knocked out, music can serve as motivation for cleaning up your place as well. Plug in some headphones or turn up the speakers and let the music take over. No matter what your music preferences may be, it can serve as a welcome distraction and make cleaning more enjoyable than if you were to clean in dead silence. One of the strongest motivators to cleaning your house or apartment is inviting some people over for a little get-together. If it has been only you at home for awhile and the mess doesn’t bother you, then you might let the clutter get a little carried away. But if you’re having a group of people over, you probably don’t want them sitting down on a moldy slice of week-old pizza. A clean home is a happy home, and after receiving a few compliments about the cleanliness of your house, you’ll be motivated to keep it that way. Like a child getting a piece of dessert after completing their homework, treating yourself to a reward after a productive day of cleaning can keep you going throughout the process. Whether you reward yourself with a nice glass of wine or a meal at your favorite spot in downtown Manhattan after a job well done, the idea of a little treat will keep you motivated. Make sure not to reward yourself before the task is complete though because then you’ll have to deal with the guilt AND still be living in a messy home. At UMG Cleaning we pride ourselves in providing our customers with the most thorough residential and commercial cleaning services in Manhattan and surrounding areas. We offer non-toxic, green cleaning services to help you keep your office, school, construction site, and especially home, clean. 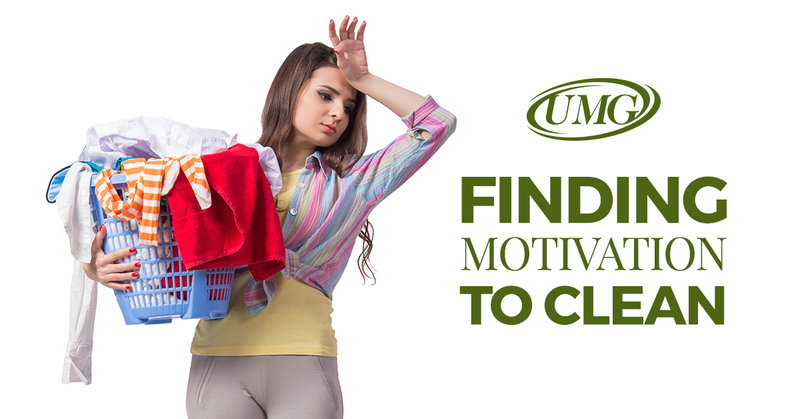 While we promise to give you the best services on the market, we can’t be with you all of the time (sorry), so make sure to use some of these tips to find the motivation you need to clean up! Contact us today to start using our residential or commercial cleaning services! At UMG Cleaning, not only do we understand that a little goes a long way. It is our duty to notice and take care of everything efficiently and thoroughly so you can have your peace of mind. Client satisfaction is our number one goal. We strive to go above and beyond to give your space the cleaning that it deserves. See what other satisfied customers have to say! Contact our specialists at UMG Cleaning for free, no-obligation, estimate! Just fill out the form information and we will be in touch shortly!